The Ausdom M06 Wireless Headphones matches expectations for budget over-ear wireless headphones. 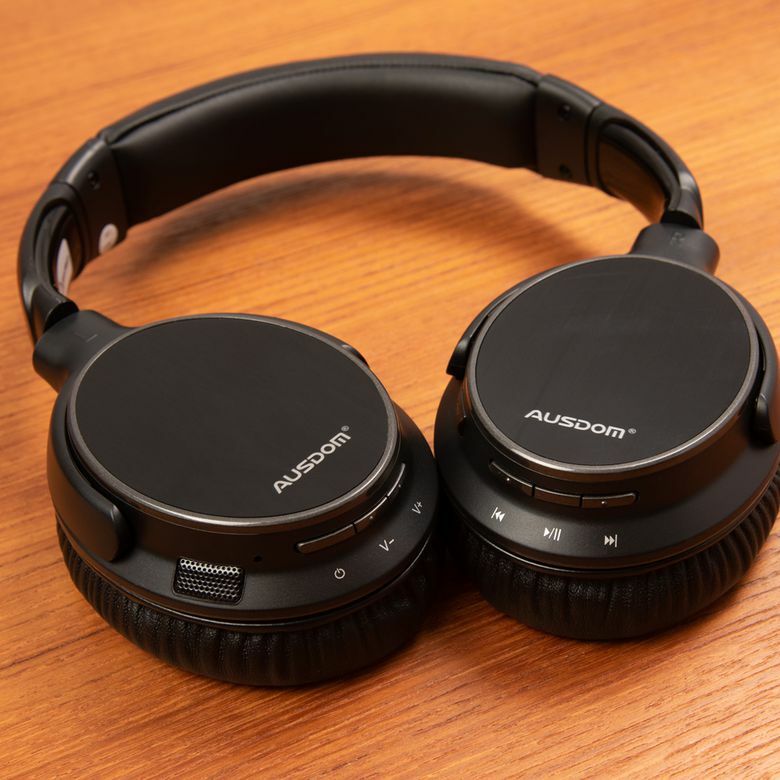 It offers stable Bluetooth connectivity and padded, comfortable earcups, but the sound quality is just average and the design has some shortfalls. With the recent advent of phones without headphone jacks, wireless headphones using Bluetooth technology are becoming popular. The downside is if you want good sound quality you’ll usually have to shell out for a nice pair of over-ear Bluetooth headphones which can be a pricey investment. That’s why the $40 Ausdom M06 Wireless Headset is such a steal due to its long range and reliable Bluetooth connectivity. While there are some design shortfalls, the lightweight body and plush earcups mean they don’t skimp on comfort. We recently tested these budget headphones for wireless connectivity, comfort over time, sound quality and basic features, and considered whether they offer quality as well as value. If you’re looking for style or high-fashion, the Ausdom M06 Wireless Headphones are not for you. A black plastic headband covers a metal skeleton and artificial protein leather covers the earcups. It won’t offend any aesthetic sensibilities, but it’s not pretty either. Fortunately, the plastic frame and metal hinges are durable and the outer earcups are plastic with a brushed black metal finish. The headphones do fold in and can rotate 180 degrees for easier storage — though there is no included carrying case. The headphones weigh in at 8.1 ounces and measure 7.8 x 7.0 x 1.2 inches (HWD). Despite the cheaper material, the Ausdom headphones are easy to wear for long periods of time. The pillowy, oval-shaped ear cushions are coated in a soft layer of artificial leather with a center of black cotton. The ear cups fit well, though seem a little small for a pair of full-size headphones. Those with larger ears should keep this in mind. We were pleased with the treble, which was never harsh. The clamping strength from the adjustable headband is insubstantial, making them less than ideal for the gym. However, because the headphones are so lightweight they’re a comfortable option for commuting. It shouldn’t be a surprise to find you get what you pay for when it comes to sound quality on the Ausdom M06 Wireless Headphones. Firstly, these are not noise canceling headphones, so the sound isolation is just adequate. You can cut out some of the audio clutter passively due to the closed back earcups, but if you want to sleep on the plane or block out your colleagues at the office these aren’t going to do the trick. They also tend to leak the other way, so people close by will be able to hear what you’re listening to. That said, if you’re walking on a busy street or taking a bike ride, you’ll easily be able to catch the surrounding traffic noises you need to be safe. Overall, we found audio quality to be average at best. For music, we listened to Anderson Paak’s single Tints, which provided a perfect mix of hard-hitting vocals in both soul and hip-hop as well as more complicated instrumentals. The bass was smooth with some extra punch for the rap and the midrange was warm though lacking in detail on the more melodious vocals. We were pleased with the treble, which was never harsh. As for podcasts, we listened to Pod Save America and found the voices flat — almost like they were underwater. The dialogue was clear enough to make everything out, but it just wasn’t crisp. The controls are all plainly marked buttons on the bottom of the earcups. Play/Pause; Skip; Rewind; Volume. A microphone sits directly next to the Power button, which you can press to answer an incoming call. The biggest problem we had was remembering where each button was while they were on our head which made it easier to just use our phone to control the headphones. Despite this difficulty with controls, connecting the Ausdom to the Bluetooth on your phone is easy. Just hold down the power button on the right earcup for 8 seconds until you see the small LED light alternatively flash between blue and red. Then you can pair over Bluetooth on your phone or other media device. You’ll get a voice prompt when it’s connected. The Bluetooth was solid, allowing me to stray about 30 feet from my phone and never disconnected when in range. Billed at 20 hours of music playback and over 250 hours of standby, we had no problem using the Ausdom M06 Wireless Headphones for three days without a recharge. If you’re looking to cut the cord without breaking the bank, these over-the-ear headphones hit the sweet spot. They come with a micro-USB cable for charging and take approximately two hours to reach a full charge, so it’s a good reason you don’t have to do it often. For $39.99, the Ausdom M06 Wireless Headphones are a steal. Nope, you’re not getting over-the-top sound quality, and the noise isolation is almost non-existent, but it is a capable product with a stable Bluetooth connection — something you usually have to spend a lot more money for. Other over-ear Bluetooth headphones in this range include the similarly-priced Mpow 059 headphones which have rich bass and come with a carry bag. For something a bit more brand name, but still affordable, you can get the Anker Soundcore Vortex wireless headset for a little more. Because both the Ausdom M06 Wireless Headset and the Mpow 059 Bluetooth Headphones are extremely affordable for the wireless category, you’re not going to get a huge difference in features or sound quality. What you will find is a more solid build on the Ausdom headset, while Mpow’s headphones are made of shiny, cheap plastic which shows fingerprints easily. However, Mpow offers seven different colors to choose from and includes a carry bag. For anything better than these, you’ll have to spend more. See our other reviews of the best headphones under $50 and our picks for the best on-ear headphones. Enjoy balanced sound and Bluetooth connectivity on a shoestring budget. The Ausdom M06 Wireless Headphones' best feature is the price. If you’re looking to cut the cord without breaking the bank, these over-the-ear headphones hit the sweet spot. But if you’re looking for superior audio quality or any type of noise cancelation, you may want to invest in a more premium product.